Diana Richardson walks in a "Unity March" with elected officials, residents and police officers in Crown Heights over the summer. This weekend, Richardson was arrested for assault after her son told police she hit him with a broomstick. CROWN HEIGHTS — Brooklyn police arrested a local assemblywoman Saturday after her 12-year-old son reported that she hit him with a broomstick, police sources said. The boy walked into the 71st Precinct in Crown Heights around 11:30 p.m. Friday with a small contusion on his right hand and told officers his mother, Assemblywoman Diana Richardson, had hit him following an argument, sources said. Police arrested Richardson at her Crown Heights home shortly after midnight on Saturday, sources said. Those familiar with the case said the incident came after the mother and son argued about his grades in school. She has been charged with assault, endangering the welfare of a child, harassment, menacing and criminal possession of a weapon, according to court records. Her office did not immediately respond to inquiries about the charges on Sunday. Richardson represents the 43rd Assembly District in Crown Heights, Prospect-Lefferts Gardens and parts of East Flatbush. 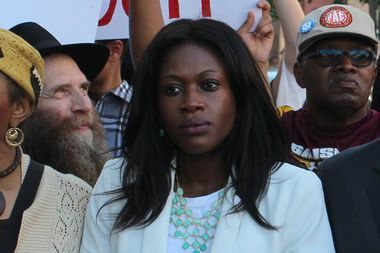 She was elected to the seat on the Working Families Party line in a special election to replace Karim Camara in 2015. She is running unopposed for reelection to the seat in Tuesday’s general election. Her son, whose name is being withheld by DNAinfo because he is a minor, became a familiar face in the neighborhood since Richardson started running for office. He frequently attended campaign events with his mom in 2015 — in her acceptance speech after the win, she thanked her then-11-year-old “deputy campaign manager” — and has often appeared with her in public since she took office. Richardson was released from custody with a temporary order of protection after her arraignment Saturday, court records show. She is due back in court Jan. 10.